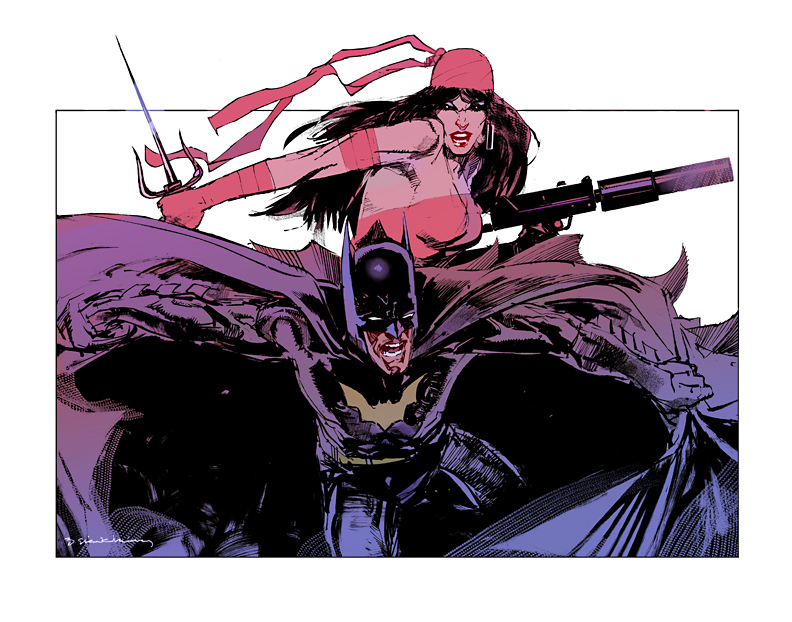 Boleslav Felix Robert “Bill” Sienkiewicz [pronounced sin-KEV-itch] (born May 3, 1958,) is an Eisner Award-winning American artist best known for his comic book work, primarily for Marvel Comics‘ The New Mutants and Elektra: Assassin. 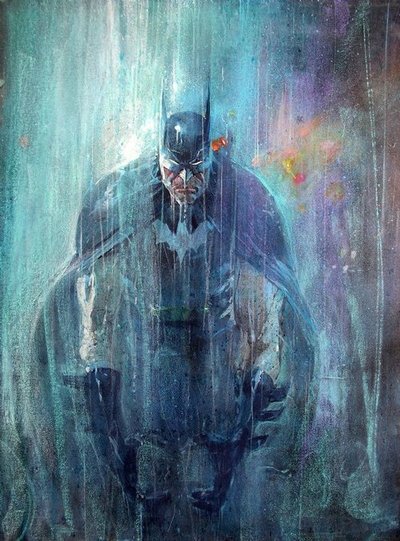 Sienkiewicz often utilizes oil painting, collage, mimeograph and other forms generally uncommon in comic books. 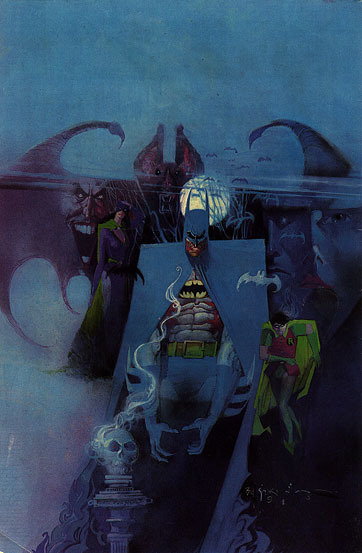 Sienkiewicz broke into the comics business at age 19 with an art style heavily influenced by Neal Adams’ work. 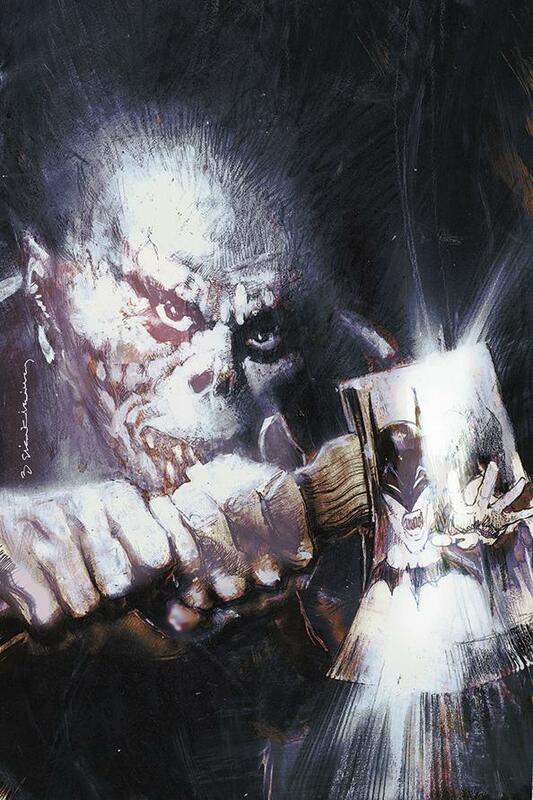 In addition to his work in comics, Sienkiewicz has also worked in numerous other media. In 1995, he illustrated the Martin I. Green biography of Jimi Hendrix, Voodoo Child: The Illustrated Legend of Jimi Hendrix. The following year he provided the artwork for the Bruce Cockburn album The Charity of Night, and went on to provide album covers for RZA‘s Bobby Digital in Stereo (1998) and EPMD‘s Business as Usual (1990). 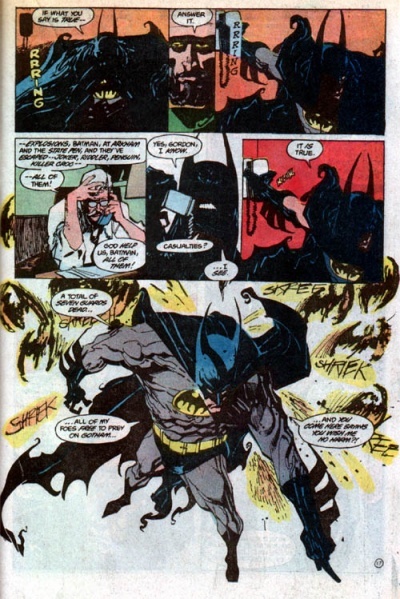 He also wrote and drew a story for the original Batman:Black & White miniseries. 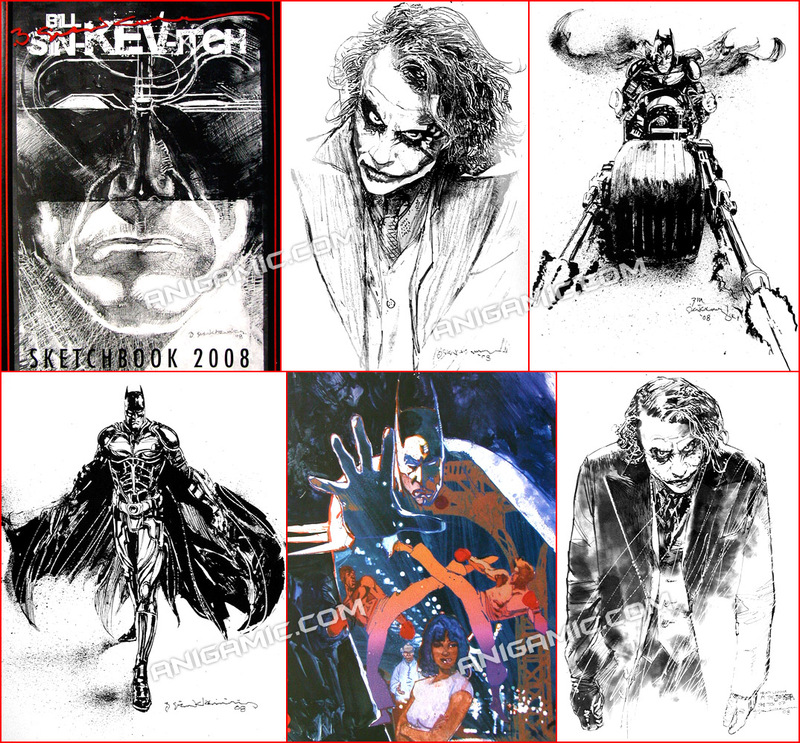 In the last decade or so, Bill has drawn various covers for the Dark Knight (most recently for the Batman: Widening Gyre miniseries written by Kevin Smith), and has inked random issues here or there. 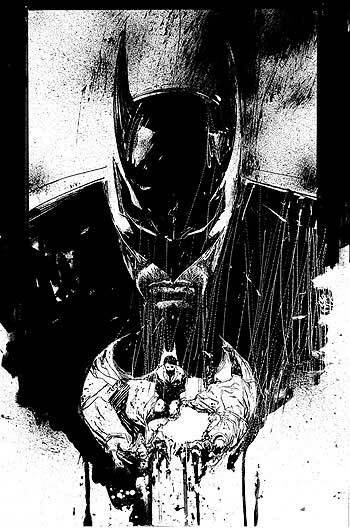 Bill Sienkiewicz: one of the most original, influential artists that comics has ever known. Laconic Oration is a blog full of interesting/inspiring images. It’s a baby created by Natalie and me. Every month, I take a handful of my favorite images from the month and post them here. For example: January, December, November, October, and September. Adults will probably not enjoy this movie much because it is very unrealistic. Also, because the whole chimpanzee thing has been overdone. However, younger viewers would probably really enjoy this. If you have young kids, give this a whirl, if not, look elsewhere for a good movie. Talents are obvious. With all of the hipe these days about girl detectives you may be tempted to try this movie. If you’re an adult, don’t. It’s 75% chimp and his tricks, 20% Dad the chimp partner, & 5% young girl who is suppose to be super smart. Good stuff if you’re under 9 years old. A cute but silly and campy movie. My children liked it but personally I liked Dunstan Checks In a lot better. As an adult viewer, I found this movie very cheesy. My 7-year-old, however, LOVES it! He did figure out the jist of the plot very early on, but he enjoyed the fact that he could pick out who were the bad guys and what they were up to. Emma Roberts, from Nickelodeon’s Unfabulous, is in this movie and is thus a recognizable face to us. Pat Morita makes a small appearance that generated big laughs from my son. Bottom line, animal + kid in the main plot = very enjoyable for kids to watch. As I said, I found it to be very cheesy, but I still liked it – just not as much as my son! A chimpanzee is not a monkey. 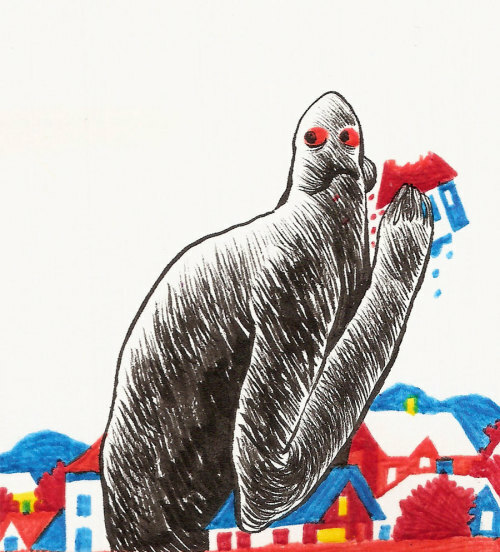 Its an ape. I dont know why people always get this confused. Apes are our closest relatives! Either way, Emma Roberts is a doll. 8 year old says its cool, even though he rolled his eyes a few times as well. A movie that adults may want to watch with a book or a second task as well, so you aren’t bored. Very fine to just put it in and let kids watch alone. Adult viewpoint: 2.5. Child 4. Not as cool as some spy flicks & we couldn’t really figure out how or why the circus people had to be involved. My 7-year old son and his cousins (ages 9 and 6)loved it. They wanted to watch it again immediately after their first viewing. My son was upset when he found out I had returned it. My children twin 8 year old girls LOVED this film. The Monkey was hillarious! Emma Roberts (the lead) was smart and a good scientist, she was very confident and brave. We recommend this to kids 7+. This was a great movie for ages five to 50. It was wonderful to sit and watch this movie with my two grandsons, even with all the laughs. A good family movie, my 10 year old kept saying the monkey had some real skills. We all enjoyed it! best movie ever!!!! so cool, i love spies(im 9), and the monkey, WOW!!!! if you dont like this movie, you are crazy. no cursing or gore. If the movie is that bad It mustve been made in the 80s or the 90s or the 70s!!! It was very funny. A monkey named Binky has to save his old spy partner and his daughter, Ameilia. It’s amazing how a monkey can do so many things: snowboarding, kung-fu fighting, acrobatics… Although some computer animation was used, it still was a great movie. SPY MATE is the most funniest mosvie ever. its all about a monkey who saves the world! who dosent like that? This was the best movie ever. My whole family loved it.Well i mean everybody that watched it. Today is my birthday and I watched it on my birthday too. This is one of my best birthdays. I defintly would recomend this to you. I know youll love it. He said I could post it here as well, so give it a read if you care at all about the advancement of technology! As you may have heard, Apple has filed a patent lawsuit against cell phone manufacturer HTC (manufacturer of the “Google Phone” the Nexus One). And as you may have also figured out, these lawsuits are a thinly-veiled attack against Google’s Android OS as well (Google, despite not being directly named in any of the lawsuits, released a statement in defense of HTC). The two lawsuits (one federal, one with the ITC) name 20 patents that Apple is claiming infringement upon. The first question is how did Apple manage to get some of these things patented? Most of them deal with OS-level software functions (ie the Android OS, not HTC’s hardware) that, if upheld by patent courts, would give Apple all but a monopoly on basic functions of smartphones or any modern-day multi-device. For example, power management functions for a digital camera or “reducing voltage to an instruction-processing part of the processor” aka sleep mode. Many of the patents also deal with specific software/OS programming techniques, like using OOP for, well, anything (graphics, notifications, multitasking) and others deal with how the OS is run. It seems that Apple took some basic, broad programming ideas and patented them being used in a specific context: in this case, on a mobile platform. Mobile phone OSes were extremely simple until smartphones came along, and Apple got a head start on everyone by a few years with the iPhone–admittedly a paradigm-shifting piece of hardware and software. In other words, they patented the basic functionality it would take to make any phone work like a desktop. And now, a few years down the line when more and more phones are becoming PC-like, Apple suddenly has the golden patents to throw the hammer down on any and all competitors. What Apple is doing here is nothing short of snuffing out technological advance to increase their own market share and, in turn, profit margin. Things like multitouch gestures are not something you should be able to patent. ”Unlocking a device by using a gesture on an image” is such a broad idea that it should have never been granted a patent to one specific company in the first place. Multitouch gestures, and smartphones in general, are natural evolutions of technological advance. OOP is not a specific idea that one company owns, but an entire method of programming. How can a company “own” multitouch? There are many manufacturers of capacitive and resistive multitouch screens. But the software that enables us to take advantage of the technology? Apple’s. In this case, Apple should at least grant third parties the license to use their patented technologies for a nominal fee like any rational company/entity. But it has instead requested to bar the sale of any and all devices who are named in the infringement case–which includes all Android phones and even some WM phones. Is Apple being overprotective of its own products or its own ideas (which is also dubious at best–the idea of a screen that responds to multitouch has probably been around for decades. I can assure you that Mr. Jobs was not the first person ever to think of it, just the first to think of using the law to claim ownership of it)? Or is it just sending out a quite large and loud first attack on the other technological mega-entity (and reasonable threat to their smartphone near-monopoly) in the room, Google? It will be interesting to see how this plays out. Google didn’t back down from China, instead directly confronting it. How will it deal with the closed regime of Appleland and its leader’s all-powerful reality distortion field?? Trust Park Chan-wook to actually do something with vampires just as we find ourselves in the midst of Twilight‘s treacly soap operatics. Considering the South Korean director’s unflinching depictions of violence and penchant for pitch-black humor, it’s actually surprising it’s taken him this long to try the genre on for size. Thirst is Park’s first American release since the conclusion of his revenge film cycle, a series consisting of Sympathy For Mr. Vengeance, Oldboy, and Sympathy For Lady Vengeance and dubbed, appropriately, the Vengeance trilogy. These films (Oldboy especially) provided him with an international audience enamored with his talent for beautifully framing and photographing acts of violence, as well as his skill for portraying morally ambiguous, existential tragedies. Thirst introduces us to Sang-hyun (Park regular Song Kang-hoo), a devout priest who volunteers for an experimental procedure in order to cure the Emmanuel Virus, a disease that kills anyone who contracts it. Miraculously he survives, and upon returning to his parish finds himself worshipped as a messiah by members of his congregation. This newfound celebrity brings Sang-hyun back into contact with a childhood friend and his friend’s young wife Tae-ju (Kim Ok-bin), with whom he becomes smitten. Soon after, Sang-hyun suddenly dies from the delayed effects of EV, only to be resurrected the following day with a newfound lust for blood (and other earthly desires). Song portrays Sang-hyun as a deeply conflicted man, one who finds it hard to understand the evils of the world. 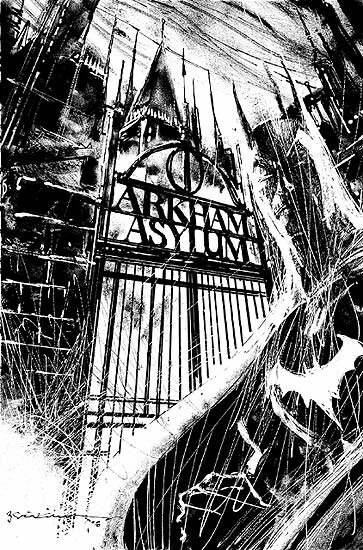 On finding himself turned into a creature of the night, he’s initially exhilarated and uses the transformation to indulge in previously forbidden vices. All the while, Song plays the priest with an nearly blank expression, deftly reigning in any grandstanding or scenery-chewing that other, lesser actors may have succumbed to. He allows the audience to read the emotions on his face, however subtle they may be. But as good as Song Kang-hoo is, the real star of the Thirst is Kim Ok-bin ,whose performance as Tae-ju fills in the major chords left unplayed by Song Kang-hoo’s more reserved portrayal. Ok-bin is a victim of circumstance, forced to marry her infantile husband for lack of options. Sang-hyun acts as a catalyst in her life; his presence allows her to tap into her dormant sexuality and as a result Tae-ju sees him as a means of escape from every aspect of her dreary life. She’s not even that unnerved when she finds out Sang-hyun’s secret; rather, she encourages his worst impulses. As the film progresses, Tae-ju is changed from a mousy doorstop into a bloodthirsty maniac who revels in the same acts Sang-hyun begins to despise. He makes bad choices based on false information provided by her, and these choices allow her to dominate the increasingly guilt-stricken Sang-hyun. Kim only began acting professionally in 2005, but here displays an ability far in excess of her limited experience. Thirst might not stay with you in the same way the Vengeance trilogy does. The plot doesn’t cover much new ground when it comes to the vampire genre, and it doesn’t possess the same thematic breadth of the aforementioned works. But the film is so well-shot and acted that this is largely a moot point. To paraphrase Roger Ebert, a film is not so much what it’s about as how it’s about. While many might be able to make a perfectly servicable film out of Thirst’s script, ultimately it’s Park Chan-wook’s unique vision and the superlative performance of his two leads that make the finished product as special as it is.